Distinguished by its southern plantation style clubhouse, Superstition Springs breathes an air of luxury. 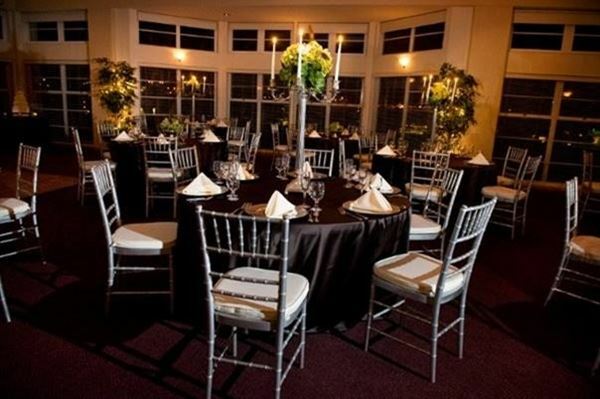 The views from our spacious Grand Ballroom are second only to the caring and genuine service of our professional staff. Lush grass, magnificent mountains, awe-inspiring lakes and waterfalls, and most impressive the breathtaking sunset backgrounds make the perfect backdrop for your wedding ceremony located on our 9th green. A variety of wedding and reception packages are available to suit your signature style. You’ll receive expert, experienced assistance in planning your wedding day by Sharon Ducati. Contact Us Today! The Wedding Package includes: •	White Garden Chairs •	Table for Unity Candle or Sand Ceremony •	Premium Four Column Gazebo with Water Features •	Private Changing Suites for Bride and Groom •	Ceremony Coordinator for Rehearsal and Day of Assistance •	Complete Set-Up & Breakdown •	Choice of House Linen & Napkins •	China, Glassware, & Silverware •	Dance Floor Please review our attachment for detailed information and menu selection. Package Pricing Does Not Include Service Charge or Tax. BREAKFAST Tee Box Continental: - Orange and Cranberry Juice - Assortment of Coffee Cake & Danish - Gourmet Coffee & Decaffeinated Coffee $8.99++ The Springs Continental - Everything Tee Box includes plus: - Sliced Seasonal Fruit $11.99++ Healthy Start - Assorted Juices - Seasonal Fruit, Yogurt & Granola - Coffee, Tea & Decaffeinated Coffee $13.99++ Classic Breakfast Buffet - Everything The Springs includes plus: - Fluffy Scrambled Eggs - Crisp Bacon & Pork Sausage - Breakfast Potatoes $15.99++ CHEF’S BRUNCH Includes everything in the Classic Breakfast Buffet plus: - Herb Roasted Red Skin Potatoes - Assorted Pastries - Warm Rolls & Butter - Choice of Salad - Choice of One Panko Chicken Supreme Ginger Soy Salmon Mediterranean Grilled Chicken $29.99++ LUNCHEONS Deli Express - Roasted Turkey Breast, Smoked Honey Ham - Assortment of Cheeses - Petite Bakery Rolls - Kettle Cooked Chips - Assorted Cookie Display - Brewed Iced Tea - Choice of Garden Salad with Choice of Dressings Tri-Color Cheese Tortellini Salad $19.99++ Golfers BBQ - Char-grilled Fresh Ground Hamburgers - Creamy Cole Slaw –or- Country Style Potato Salad - Kettle Cooked Chips - Assorted Cookie & Dessert Bars - Brewed Iced Tea $19.99++ With Southwest Marinated Chicken Breasts: $21.99++ Retreat BBQ - Petite Marinated Flat Iron Steaks - Grilled Southwest Chicken Breasts - Caesar Salad - Roasted Red Potatoes - Baked Beans - Petite Rolls & Butter - Assorted Cookie & Dessert Bars - Brewed Iced Tea $29.99++ Premium Lunch Buffet - Choice of Salad - Choice of two accompaniments - Choice of Entree Mediterranean Chicken Panko Encrusted Chicken Breasts Creamy Dill or Ginger Soy Glazed Salmon Oven Roasted Stuffed Pork Loin - Assorted Cookie & Brownies & Gourmet Coffee & Decaf $29.99++ Add Dessert for $2 per person See attachment for details and additional options. "Shine" Warm Rolls & Butter Choice of One Cold Hors D’oeuvres Station Choice of One Salad Choice of Two Accompaniments Choice of One Chafered Entrée Unlimited Fruit Punch Station Gourmet Coffee or Hot Chocolate Station Champagne and Sparkling Cider Toast Custom Wedding Cake $38.99 ++ per adult person $21.99 ++ per child (ages 5 ~ 12) "Sparkle" Warm Rolls & Butter Choice of Two Cold Hors D’oeuvres Stations Choice of One Salad Choice of Two Accompaniments Choice of Two Chafered Entrées Unlimited Soda Unlimited Fruit Punch Station Gourmet Coffee or Hot Chocolate Station Champagne and Sparkling Cider Toast Custom Wedding Cake $52.99 ++ per adult person $29.99 ++ per child (ages 5 ~ 12) "Glisten" First Hour of Beer, Wine & Soft Drinks Warm Rolls & Butter Choice of Two Cold Hors D’oeuvres Stations Choice of One Butler Passed Hors D’oeuvres Choice of Two Salads Choice of Two Accompaniments Choice of One Carving Station Choice of One Chafered Entrée Unlimited Fruit Punch Station Gourmet Coffee or Hot Chocolate Station Champagne and Sparkling Cider Toast Custom Wedding Cake $65.99 ++ per adult person $36.99 ++ per child (ages 5 ~ 12) "Dazzle" First Hour of Beer, Wine & Soft Drinks and Liquor Warm Rolls & Butter Choice of Five Butler Passed Hors D’oeuvres Choice of Two Salads Choice of Three Accompaniments Choice of One Carving Station Choice of One Chafered Entrée Candlelight Wine Service with Dinner Unlimited Fruit Punch Station Gourmet Coffee or Hot Chocolate Station Champagne and Sparkling Cider Toast Custom Wedding Cake $78.99 ++ per adult person $43.99 ++ per child (ages 5 ~ 12) See attachment for menu selections.